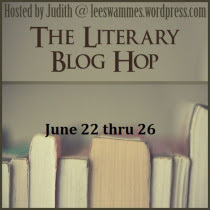 Laurie Here - Contemporary Fiction and MORE - Book Reviews: The Literary Blog Hop! Sat June 22nd at midnight until Wednesday, June 26th, 2013! The Literary Blog Hop! Sat June 22nd at midnight until Wednesday, June 26th, 2013! This Literary Blog Hop starts on NOW!!! - June 22nd and runs to 11:59pm till midnight on Wednesday, June 26th! You can start entering at the above time - Or sooner if you see the forms up! I'm excited for this one because there are always some GREAT reads you can add to your TBR pile IF you don't win them! I add them as I go through the Hop, and if I win one, it's a BONUS! My giveaway is: INTERNATIONAL! As long as your country allows ebooks to be given! To see what I'm giving away - CLICK HERE! There will be "2" Hops going on at the SAME TIME! After entering this one, PLEASE SCROLL DOWN on the Giveaway Page to see ALL the other blogs that are participating in this Hop! Then SCROLL DOWN TO ENTER THE "MIDSUMMER'S EVE GIVEAWAY HOP"! 2 HOPS IN ONE STOP!